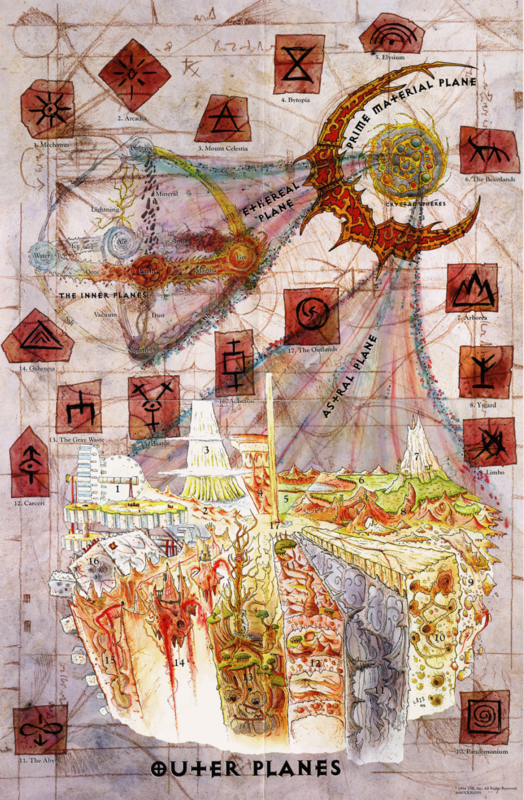 Planescape is a campaign setting for the Dungeons & Dragons originally designed by Zeb Cook. The Planescape setting was published in 1994. As its name suggests, the setting crosses and comprises the numerous planes of existence, encompassing an entire cosmology called the Great Wheel, as originally developed in the Manual of the Planes by Jeff Grubb. This includes many of the other Dungeons & Dragons worlds, linking them via inter-dimensional magical portals. Sigil, the “City of Doors”, is located atop the Spire in the Outlands. It has the shape of a torus, and the city itself is located on the inner surface of the ring. There is no sky, simply an all-pervasive light that waxes and wanes to create day and night. Sigil cannot be entered or exited save via portals. Although this makes it quite safe from any would-be invader, it also makes it a prison of sorts for those not possessing a portal key. Thus, many call Sigil “The Bird Cage” or “The Cage.” Though Sigil is commonly held to be located “at the center of the planes” (where it is positioned atop the infinitely tall Spire), some argue that this is impossible since the planes are infinite in all dimensions, and therefore there can never truly be a center to any of them, let alone all of them. Curiously, from the Outlands, one can see Sigil atop the supposedly infinite Spire.